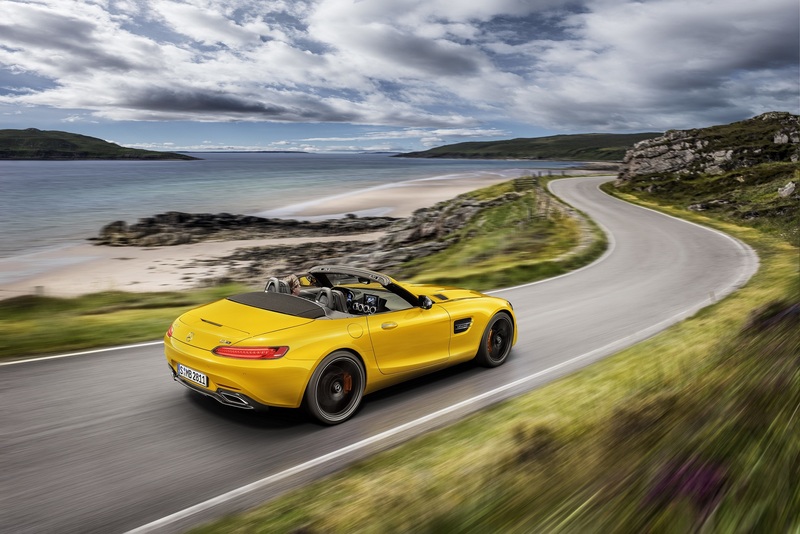 Mercedes-AMG is extending its sports car portfolio with the new AMG GT S Roadster as an attractive open-air model. With this latest addition the AMG GT family now has a dozen members: four two-door Coupés, three Roadsters, two customer sports racing cars and three four-door Coupés. 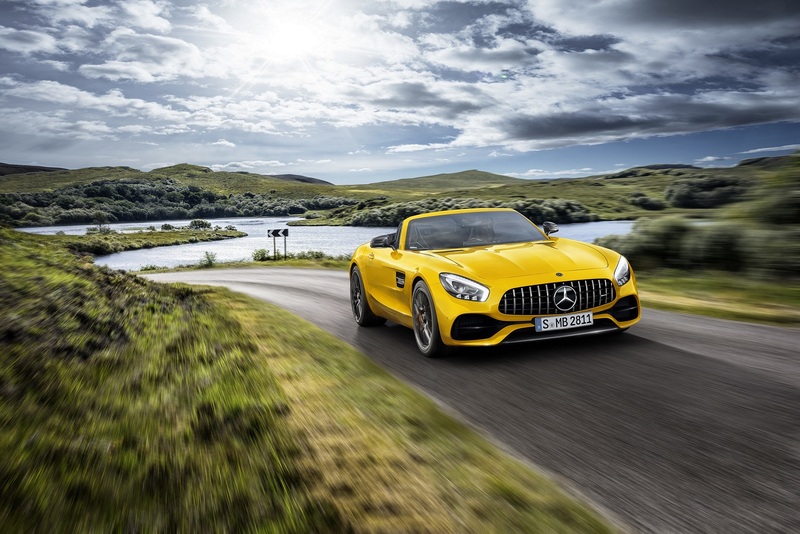 The basis for the high Driving Performance of the new AMG GT S Roadster is the combination of a lightweight aluminium spaceframe, a V8 biturbo engine, a seven-speed dual clutch transmission, a rear axle locking differential and a sport suspension with aluminium double wishbone axles. The two turbochargers of the V8 are not positioned on the outside of the cylinder banks, but inside the cylinder “V”. Advantages: a compact engine design and spontaneous response of the turbochargers. The driver is able to set the AMG GT S Roadster to his/her individual requirements using the AMG DYNAMIC SELECT controller. Five drive modes, “C” (Comfort), “S” (Sport), “S+” (Sport Plus), “RACE” and the individually programmable setup “I” (Individual) are available. These allow a broad range of driving experiences – from comfortable to very sporty. By pressing the separate “M” button in the centre console, the driver can activate the manual transmission mode in any drive mode to change gear using the steering-wheel shift paddles. The greatest benefit of the electronic rear-axle limited-slip differential is the even more sensitive and proactive control, which pushes the critical threshold higher, making it even easier to drive at the vehicle’s limits. The AMG high-performance composite brake system is adapted to the enhanced performance of the AMG GT S Roadster. The front axle features composite brake discs measuring 390 x 36 mm with 6-piston fixed callipers, with composite brake discs measuring 360 x 26 mm and single-piston fixed callipers at the rear. The brake callipers are painted in red with “AMG” lettering. There is also the option of the AMG high-performance ceramic composite braking system with brake discs in size 402 x 39 mm at the front axle and 360 x 32 mm at the rear, together with specially painted brake callipers with “AMG Carbon Ceramic” lettering. Exceptionally short stopping distances, a precise pressure point and outstanding resistance to fading even under extreme operating conditions. The three-layered fabric soft top is supported by a magnesium/steel/aluminium structure of low weight, which helps to keep the vehicle’s centre of gravity low. Additional roll-over protection is provided by an integrated aluminium cross- member, while the inserted acoustic mat improves noise comfort. From the expressive AMG radiator grille to the long bonnet and the muscular tail end, the two-seater guarantees a pure sports car experience even when stationary. The flat front section and forward-sloping radiator grille make the Roadster appear to hug the road. At the same time this shape lowers the vehicle’s back-pressure point, enhancing the flow of cooling air and the car’s aerodynamic performance. As standard the AMG GT S Roadster comes with the AMG Silver Chrome Interior package. This creates particular highlights with trim in high-quality silver chrome. The package consists of a centre console surround, air vent bezels and trim strips in the door armrests in silver chrome. Optional extras include the AMG Piano Lacquer Interior package – trim surfaced in luxurious, shining piano lacquer accentuates the high quality of the interior. On the basis of the extensive standard equipment, the Mercedes-AMG GT S Roadster offers wide scope for individual wishes. The AMG DYNAMIC PLUS package ensures even higher driving dynamics and even sportier handling characteristics.